Emma-Rosa Dias is a freelance TV presenter from Belfast. As a small child in the early 80's she had her first encounter with mods whilst helping out in the popular Belfast record store, Blinkers, ran by her mother. It was from this moment that her fascination with the mod scene grew and now she has set out on a journey to discover what has made it so enduring to this day. 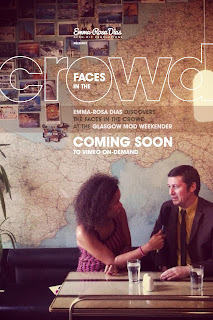 The documentary, Faces in the Crowd, is filmed during the Glasgow Mod Weekender and includes fascinating insights, images and stories from mods of all generations. Particularly absorbing is the story of Peter a mod from the 60's who encountered the mod scene first hand as a 14 year old in London. Throughout the documentary Emma captures the warmth of the mod scene crowd and manages to reflect all aspects of it. You can see that she has been meticulous in her preparation and interviews smart, knowledgeable people like Paul Boddy and Sandra Hutchinson who know the finer details of mod style and readily share their knowledge. Finally, somebody has got it right when making a documentary on the mod scene! This is a fantastic documentary because Emma has actually listened to the subjects and let them set the scene, rather than all those so called journalists who just want to see parkas, mod n rockers and all the other caricatures. The documentary has been completely self-funded - Emma employed young, talented student film-makers from Glasgow to assist with the production and filming. But, this is not the end of the story...as Emma says; 'It's a complete lifestyle that people really cherish and protect. I was lucky enough to meet a lot of wonderful people in the filming of this documentary and I am so grateful they shared with me. The next step is to develop this story in a series of documentaries on mods worldwide. I've only seen the tip of the iceberg and there's so much more I have to explore and many more key people I have to meet. I hope I can take it further and start to get funding. If the support and feedback continues to be as good as it has been then that's exactly what I'll do."